A small ongoing confusion bubbled up into a comedy of errors at the recent JambaLAya conference in New Orleans. 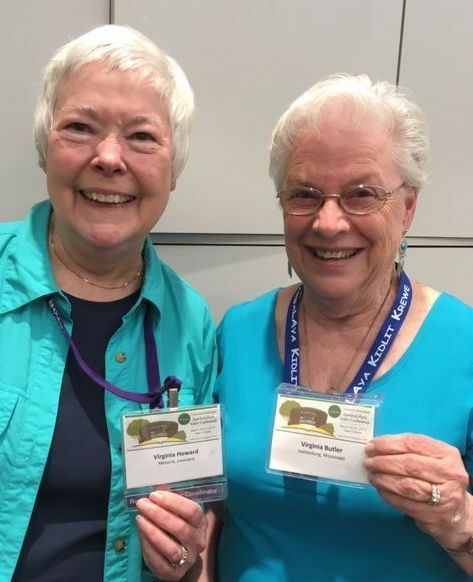 For more than twenty years, Virginia Howard and I have been members of the Society of Children’s Book Writers and Illustrators and active in the critique group that meets monthly in New Orleans. The small confusion arises when we sit together at meetings as to which Virginia is being addressed. Our former regional advisor Carrel Muller also likes to tell how she, in her introduction to the panel she was hosting with Virginia Howard as the final member, cautioned herself repeatedly as she worked her way down the panel, “Don’t say Virginia Butler.” Of course, when she reached her final panelist, she said, “And this is Virginia Butler.” However, our March JambaLAya conference set a record for mix-ups. In the first afternoon social gathering, a man asked me about the emails he had sent for permission to exhibit at the illustrators table. I assured him that, knowing the extent of my artistic ability, no one would let me near the illustration table much less put me in charge. He continued insistently, reminding me of what was in the emails and what I had said in return. I remained baffled and was never sure that I had convinced him that I had no part in this email exchange. It was only later at dinner with friends that I realized he thought he was talking to Virginia Howard. As soon as I saw Virginia H. the next morning, I told her I had a story for her. She also had one for me. In the previous day’s master classes, she attended the one for illustration while I opted for the one for writers. Chuck Galey (who gave permission to use his name) approached her and said how much he enjoyed reading her blog. She explained that she did not write one and that he had mistaken her for Virginia Butler. The next morning when he saw her again, he told her he had mistaken Virginia Howard for her and repeated his compliment about her blog. Once again, she corrected his mistake, and before the day was over, he had his Virginias straight. Later at the conference, a nice young woman came over bringing Virginia Howard’s new picture book and asked me if I would sign it. I told her I would be glad to sign it, but I thought she might prefer it to be signed by the Virginia who wrote it. Both Virginias have gray hair and chose to wear turquoise to the meeting which may be a part of the confusion, but in other ways they are quite different. Virginia Howard is both illustrator and writer. Virginia Butler writes, but even her stick figures need an explanation. Virginia Howard has a delightful new picture book (soon to be on this blog) hot off the press. Virginia Butler wishes she had a delightful new picture book hot off the press. Virginia Howard is editor of the fine literary magazine Thema. Virginia Butler enjoys seeing her work published in the fine literary magazine Thema. Virginia Howard lives in Metairie, Louisiana. Virginia Butler lives in Hattiesburg, Mississippi. If this is not enough to clear things up, you might try using the name tags, or just blunder along and add another story to our repertoire.